1 of 6 Heat oven to 400 degree F.
2 of 6 Grate lemon peel and set zest aside; cut lemon into quarters. Separate skin from breasts of chicken. Under skin, spread lemon zest, garlic and two of the tarragon sprigs. Season outside and cavity of chicken with 1/2 teaspoon of the salt and 1/4 teaspoon of the pepper. Place lemon quarters and remaining 4 tarragon sprigs in cavity. Place chicken in center of a large roasting pan. Roast on lower shelf at 400 degree F for 30 minutes. 3 of 6 Toss potatoes, 1 teaspoon of the olive oil, 1/4 teaspoon of the salt and 1/8 teaspoon of the pepper in a medium-size bowl. Coat second large roasting pan with nonstick spray; add potatoes. After chicken has roasted for 30 minutes, add potatoes to top shelf; roast both 15 minutes longer. 4 of 6 Combine asparagus, leeks, remaining 1 teaspoon oil, remaining 1/4 teaspoon salt, and remaining 1/8 teaspoon pepper in a medium-size bowl; toss to coat. 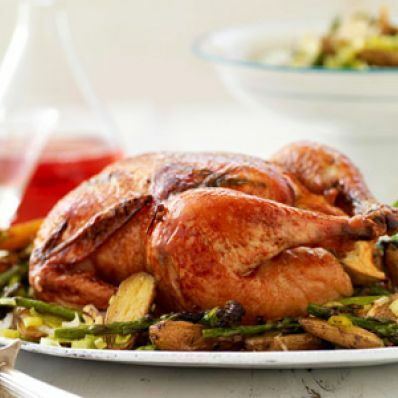 5 of 6 After potatoes have roasted for 15 minutes, add asparagus mixture to pan; roast chicken and vegetables 25 minutes longer, stirring once. Chicken is done when internal temperature measures 165 degree F on an instant-read thermometer inserted in the thigh meat. 6 of 6 Let rest 10 minutes before carving. Remove and discard skin before serving.